Damien Chazelle is now three for three. Director Chazelle’s first film was Whiplash, which was tremendous. His second film was La La Land, which was critically acclaimed (while I found it okay) and brought him an Oscar. Now, Chazelle has his trifecta with the story of Neil Armstrong, the first man on the moon. First Man tells the intensely personal story of Neil Armstrong and his losses and sacrifices during his life that led him to being the first man to step foot on the powdery surface of the moon. The film goes from 1961 to 1969 and focuses on the man more than it does the moment. And the film really started with a gut punch that I did not know was coming. Of course, I knew who Neil Armstrong was, but I will admit to not knowing that much about him. This biopic dove into details that place the American hero into a brand new perspective. Armstrong’s family suffered a tragedy at the beginning of the film that, apparently, taints everything that happens after it. Ryan Gosling played Neil Armstrong and, to be honest, I found the character to be quite a jerk. He was withdrawn and isolated, even from those who loved him the most. However, we also see how brilliant of an astronaut he was as the film showed us several instances where his skills were the only reason he and the other crew members he was with got out of those situations alive. Claire Foy is brilliant as Armstrong’s wife, Janet. She brought the humanity to the film and demanded that her husband be more than just the walking zombie that he appeared to be. Foy’s performance was powerful and fit perfectly into the narrative. One of the things I noticed was that Chazelle gave us some great shots throughout the film. I would stop and marvel at several of these visual imagery on the screen and I was really impressed with the eye of the director. There was one moment where Gosling’s eyes kind of melded into the darkness of space, but still stood out in the shot and it was amazing. My only criticism is a personal one as well. Some of the scenes in the shuttles were difficult to watch because of the drastic spinning. I am sure this was a choice made that was intended to make the audience uncomfortable to increase the tension but I did not like them. There were several moments where I had to turn away to maintain my own balance. I can’t imagine what it would be like for someone who really had trouble with motion. At times, it reminded me about how I felt while watching Dunkirk, which attacked me physically and made the viewing unlikable for me. This was not at that level, but there were definitely moments that caused distress. There were times where First man felt a little slow, but that is not a bad thing. It is a character study on Neil Armstrong and the events of his life that led him to become a myth. 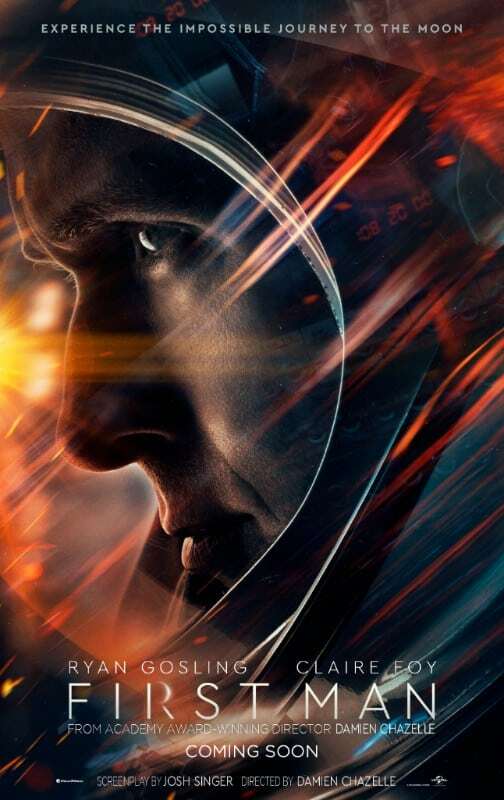 We see in First Man that the myth has some reality hidden in it.